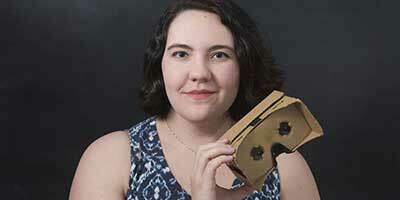 Inspired by her “technologically savvy” family, Emma Elliot, a senior computer science major, spent the last six months creating a unique virtual reality video game for her senior project. She was initially attracted to the idea of creating a video game of her own while in Lynchburg’s Game Programming class. “In the second semester of junior year, I talked to Professor Joe Meehean about my senior project, and we figured out that I could actually do something with virtual reality,” Emma said. With the help of Dr. Meehean, Emma produced a virtual reality video game utilizing Unity and Google Cardboard. Unity is a 3D game engine that allows computer scientists to program virtual reality video games. Google Cardboard is a headset that players wear during the game to see the virtual world through their smartphone screens. This computer genius also has an artsy side. Emma is a theatre minor who fell in love with the unique combination of computer science and the theatre program on one of her initial tours of University of Lynchburg. She is now very active in the theatre department, which gives her a bit of an advantage compared to other computer science majors. Also, her theatre background allows her to easily explain complex concepts. She explains that someone who only studied computer science might only be able to articulate ideas in “terms that other computer scientists could understand,” while she has the ability to present and explain complex topics to other people in terms they could easily comprehend. Emma completed her virtual reality senior project in about six months and presented the game during the Student Scholar Showcase in April. Dr. Meehean pointed out that a full-fledged video game generally requires more than 18 months with dozens of programmers and artists working together. “I think this project demonstrates the amazing projects that LC students can create after completing their studies here,” said Dr. Meehean.